Stayed in Bhutan for a week and I really had an amazing experience in the Land of Thunder Dragon. Special thanks to Sangay Dorji who had patiently replied to all my queries and had arranged everything in order. To my tour guide Ugyen and tour driver Jangyang whom had done a great job for taking care of me the entire week, a million thanks. These were my very FIRST time and it all happened in the Kingdom of Happiness. 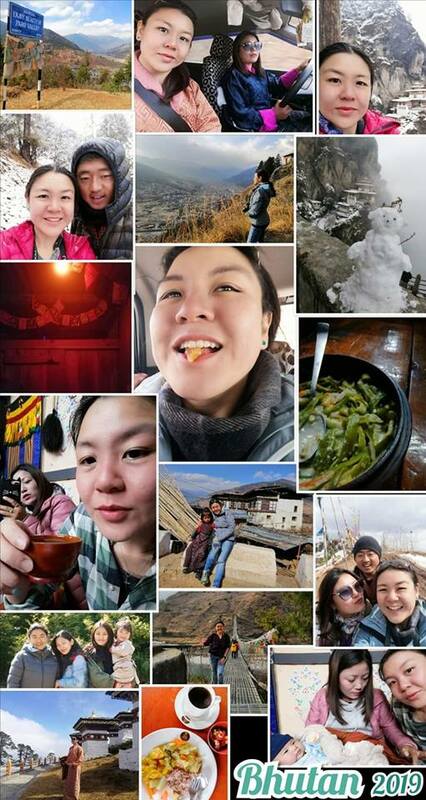 Kadrin chhe la (Thank you) Bhutan for giving me lots of wonderful memories. Tashi Delek. ❤️🇧🇹. 1. Hid behind the bushes to answer the call of nature while facing the beauty of Paro Valley. Thanks to my lady tour driver for being my watchguard. 2. Hiked on a rough trail not only once but 4 times in just a week. Thanks to my reliable tour guide who also became my walking stick most of the time. 3. Hiked up and down while snowing just to see the Tiger's Nest monastery. 4. Ate a dried hard cheese like sucking a hard candy. It may take time to melt but never ever chew. 5. Soaked in a traditional medicinal stone bath wooden tub to relieve all the body aches and joint pains. Best recommended after trekking. 6. Ate green and red dried chili melted cheese locally known as Ema datshi. It is very addictive. 7. Drank 3 cups of local rice wine consecutively known as ARA with an 18% alcohol content in honor of their country, their king and their gods as a tradition.. that would be my last. It will never ever happen again. 8. Asked a schoolgirl by the roadside for a memorable photoshoot behind a Bhutanese house. 9. I was approached by a family to take a photo of them as my souvenir during the 2nd day of Losar new year aka CNY. 10. Walked back and forth on a suspension bridge full of prayer flags. 11. Worn a traditional Bhutanese attire known as Kira in Dochula Pass while viewing the Himalayan ranges. 12. Welcomed in a traditional Bhutanese house who hosted my farewell dinner.